Our homes are not just a dwelling place. It is our fortress of security and a place where we can be ourselves—a place that represents us, our lives, and personalities. That is why we constantly find ways and take measures in ensuring that our homes are safe, secure, comfortable, and beautiful. Cleaning the gutters and drain pipes in your roof can both be dangerous and time-consuming. Leave the work to us, and we will have your gutters leaf, dirt, and grime-free. Leaves, twigs, and even branches can be such a hassle to clean up during the fall or spring time. These can also clog up drainages and gutters, and clutter your garden landscape. Allow us to handle the work for you, then, with our efficient spring and fall clean-up services. Maintain the clean and aesthetic state of your garden or yard by regularly trimming your shrubs and hedges. Now, this may take time and a lot of work, so just leave it to us to carefully and trim your shrubs and hedges, making them neat and beautiful again. 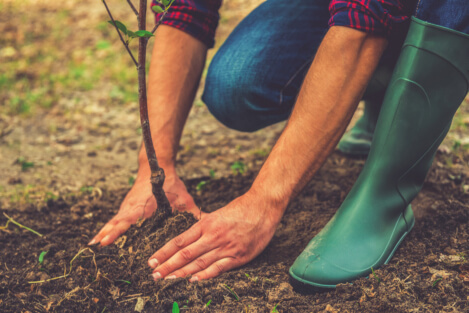 We may be known for our tree removal service, however, we also offer tree planting services if you would like to have trees in your property to keep your ground firm and later protect your house from floods and erosion. If you have trees in your yard and would like them to be neat and tidy for aesthetic purposes and to prevent wilting branches from damaging your house, then trust our quality and neat trimming and pruning services. Keep your garden flowerbed neat and tidy with our help. We offer flowerbed maintenance services which will keep your flowers looking beautiful. At AJ Tree Service, we are committed to helping you clean up your residential or commercial properties and transform them into safe, neat, and beautiful spaces. We offer more than just tree service in Tulsa, Oklahoma, we make sure to provide exceptional landscaping, trimming and pruning, garden maintenance, and lot clearing services with the aim of improving and properly maintaining the overall state of your property. Talk to us today at 918-232-4853 and see how we can help you. This entry was posted in Professional Tree Service and tagged Landscaping, tree removal service, Tree Trimming. Bookmark the permalink.